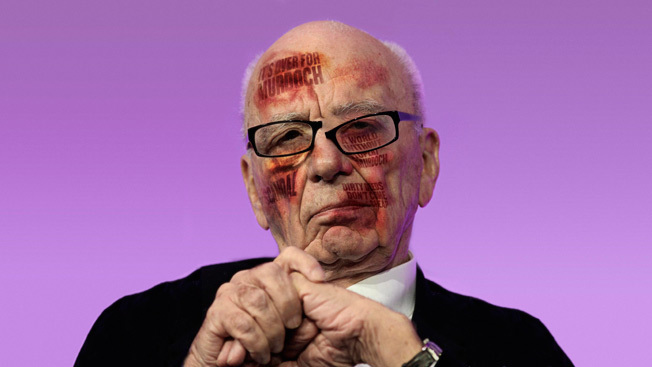 Despite a turbulent fourth quarter defined by the phone hacking scandal, News Corp. reported on Wednesday afternoon that its total operating income for the quarter was $1.35 billion, a 45 percent increase from the $932 million reported this time last year. Still, the media giant pulled out one big gun to further alleviate investors’ concerns: Rupert Murdoch himself. The octogenarian chairman and CEO of the media conglomerate joined analysts on the company’s quarterly earnings call on Wednesday afternoon—Murdoch’s first such appearance in about a year. This was a bold move by News Corp.—the ageing Murdoch is known for his off-the-cuff remarks in public forums despite rigorous preparation efforts by his team. However, the company sorely needed to preserve shareholder confidence after five weeks of the nonstop unraveling of a phone hacking scandal that has led to the shuttering of a profitable newspaper, the arrests and resignations of company executives and employees, and criminal investigations. Marking the end of the News Corp. fiscal year, the media conglomerate reported a full-year adjusted total operating income of some $5 billion—a 12 percent increase in contrast to the $4.46 billion last August. News Corp. attributes this uptick to growth in its television division, which includes Fox and the profitable American Idol franchise. Exacerbating matters is a lack of a succession plan. Murdoch, 80, came off as a befuddled oldster when he testified before Parliament on July 19. The timing for the call couldn’t be better. News Corp. directors met yesterday in Los Angeles, and other possible board decisions may be announced as well, including what to do following its abandoned $12 billion bid to acquire the 60 percent stake in BSkyB that it did not already own. “With all the money that is burning a hole in their pocket now that they don’t have BSkyB to buy in, they can certainly buy back more [shares] of the $5 billion they indicated in early July over the next year," says Dix. "They don’t need as much cash as they’re carrying at the moment."